Folk Alley | Video Premiere: Amanda Anne Platt & the Honeycutters, "Birthday Song"
Make peace with it - that's the best piece of advice I (or anyone) can give you. Make peace with the fact that, yeah, every year, there's going to be a new ache or pain, a new wrinkle or line, a new droop. It's part of getting older - it's part of living. Amanda Anne Platt and the Honeycutters are living large in 2017. With a new name and a new self-titled album, this talented bunch of musical friends aren't afraid to hit the road, to try new things, and to admit that they, like all of us, have moments of insecurity about life, living, and getting older. 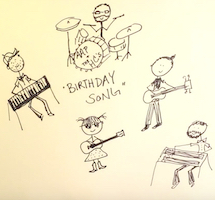 And that's what the video for "Birthday Song" is all about. Shot in and around their home base of Asheville, North Carolina (and at Birdfest in Pinewood, South Carolina and in Dandridge, Tennessee, too), you see the band as they live their lives. At home, in the kitchen, on the road, on the stage - this quintet is making music, and celebrating the fact that their lives keep on moving forward. Yeah, you're getting older. But the alternative isn't great, is it? So, take heart and be glad to be where and when you are.